Located in the Undead Burg, this merchant is an Undead who has a hollowed appearance, but is not fully hollow. She primarily sells moss she has grown herself behind the iron bars, as well as other useful consumables. As many speculate, Yulia, the companion of the Male Undead Merchant can possibly be the Female Undead Merchant. 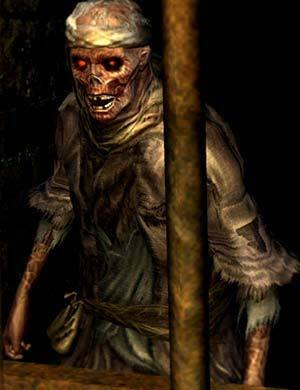 She appears behind iron bars in the sewers and hile it is unclear how she ended up there, it may be that she was locked up or ran away - both could be what the Male Undead Merchant is hinting at by saying "You'd never leave my side, now would you, Yulia?". Yulva is known to be one of the sealers of New Londo who later left their duties. These sorcerers were once healers and Yulva's gear and miracle Remedy is found atop Blighttown. The mosses to dealt with the poisons and toxins of Blighttown are only sold by the Undead Female Merchant (not counting the DLC), along with the moss that clears bleed build-up. She also has an unlimited amount of Purging Stones and Transient Curses, items that Ingward, a known and alive sealer also sells and are most useful in New Londo Ruins. Considering her vast knowledge of Blightown and the knowledge about curses is it possible that she is actually Yulva who has started to lose her marbles after the curing of Blighttown proved to be a task too difficult or perhaps because of the guilt she felt after flooding New Londo, killing many innocent people. This is a wonderful place, don't you think? I like it here, I really do. Nothing good ever happened to me in life. But now that I'm Undead. I've never been happier! You think I've gone to the other side, don't you? Ah, go down along the side to reach the depths of the Burg. Only umkempt crooks and liars to be found there. Hardly a place for a lady like myself! But who knows, maybe you'd fit right in? Vee hee hee hee hee!